I am so excited to share with you my new book. My book has been a true labor of love for the last 14+ months and to finally have a copy in my own hands feels a little surreal and I will always be thankful to my publishers, Tuva, for giving me this amazing opportunity. "Quilting on the go ... English Paper Piecing" has 16 projects, ranging from a Zipper Pouch, Mini Quilt, Placemats right through to a Baby Quilt and then there is the Cover Quilt - Celestial Star. 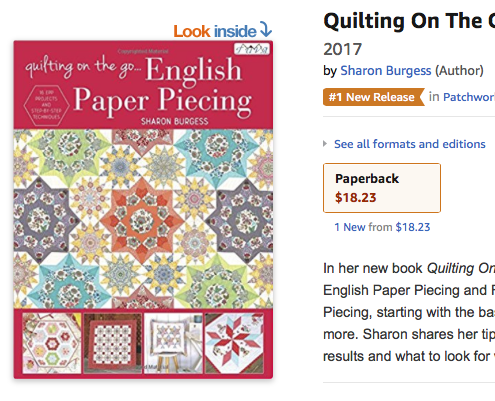 "Quilting on the go ... English Paper Piecing" is available for order now. Also, ask for it at your Local Quilt Shop. I have some amazing people joining me for a Book Tour starting 1st July. I am looking forward to sharing the projects, both mine and the Tour Participants with you on Instagram, Facebook and here with some weekly round ups. As well as sharing some exciting news about some EPP Paper kits. I'll be putting this on my Santa list for sure. 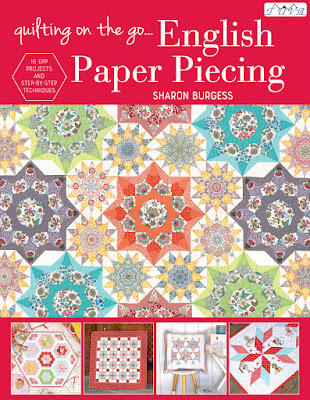 Thank you very much for sharing valuable tips to help us to make decoration piece of papers. Congratulations; it looks wonderful. Much success to you. I have your book on my wish list!